Download latest HP Spectre x360 13-AP0043DX drivers for Windows 10 64 Bit you can download and install to get your laptop work properly. 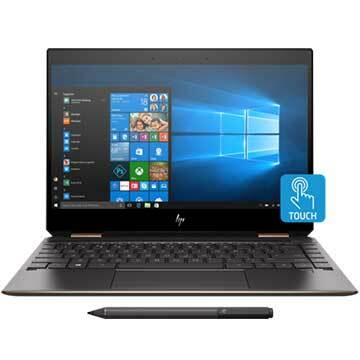 HP Spectre x360 13-AP0043DX is 13.3 inch laptop powered by 8th Generation 1.8 GHz Intel Core i7-8565U quad-core processor with integrated Intel UHD Graphics 620 video card. This HP 13-AP0043DX notebook PC comes with 16 GB DDR4-2400 SDRAM system memory and fast 512 GB PCIe NVMe M.2 SSD solid state drive to store files, videos, and other documents. This mobile computer features 13 inch 4K IPS (3840 x 2160) touch screen display with Corning Gorilla Glass NBT, Intel Wireless-AC 9560 802.11b/g/n/ac (2x2) Wi-Fi, Bluetooth 5 Combo, backlit keyboard, microSD media card reader slot, Thunderbolt 3 port, USB 3.1 Gen 2 port, USB 3.1 Type-C Gen 2 port, Full HD web camera, quad speakers with Bang & Olufsen audio technology, and 4-cell 61 Wh Li-ion battery.